The Book, IN THE DRIVER’S SEAT: A GIRL’S GUIDE TO HER FIRST CAR Is Out Now!! I'm lucky enough to write life guides for teens. Yesssss! 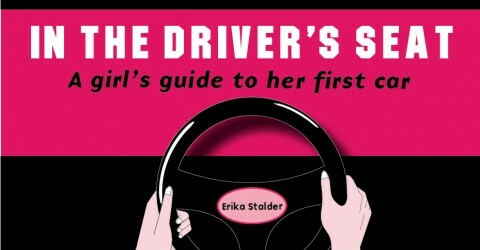 This site is a companion to my latest book, In The Driver's Seat: A Girl's Guide To Her First Car. Here, we ladies will rap about car wins and woes--all in the name of making us rockin' drivers behind the wheel. Let's Go! How Severe Are Your Driving Conditions? Are you following your car manual’s maintenance guide? Awesome. But the latest AAA Car Care Month study raises the following question: Are you following the rightmaintenance schedule based on the conditions you drive in? Manuals have two maintenance schedules–one for normal driving conditions and one for severe driving conditions. The schedule you should follow depends on how you drive your car. The study found that 62 percent of drivers who are driving under severe conditions don’t even realize they’re doing it–they think the short trips, driving off-road and motoring through stop-and-go traffic in the heat is normal stuff that leads to normal wear and tear. Not so, says AAA. These conditions are considered severe and demand a more rigorous maintenance schedule. Drive on short trips of less than 5 miles in normal temperatures or less than 10 miles in freezing temperatures? Drive in stop-and-go traffic when it’s hot outside? Drive at less than 50 miles per hour for long distances? Drive on dusty, muddy, sandy or gravel or salt-covered roads? Tow a trailer or camper or carry stuff in a roof rack or car-top carrier? If you’re rockin’ a “yes” to most of these questions, then you’re driving in severe conditions. And severe driving conditions call for more frequent fluid and filter changes. For deets on what to do, check your manual.